In the summer of 2012, Onra & Lexis joined forces to tackle a project based on a music period they both love so much. That brief period from approximately ’93 to ’96: the New Jack Swing sound got dated and soulful club music became much closer to the Hip-Hop productions of the time to create this Urban R’n’B type of music. 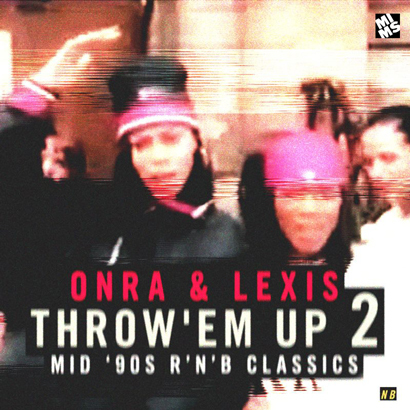 We simply call this era the “Throw Em’ Up” period in reference to the way that everyone in clubs and videos was vibin’ to these tracks: just throw up both your arms and wave them around nonchalantly (if possible with a champagne glass). The selection rules we followed for Vol. 2 are simple: #1: Soul artists featuring MC’s are ok, but not the other way around. #2: All of the picks have to pass the “throw em’ up” dance test, which means: no New Jack Swing stuff, no Timbaland because although Timbo is a genius it’s really a different kind of sound which shaped the late 90’s / early 2000’s sound. So after the huge success of Throw Em’ Up vol.1 we decided we had to do it again because there are just so many amazing tracks that never really made it big that deserve to be heard! So after weeks of obsessive research, the mix was recorded live in one take. We made sure to stay under 80 minutes so you can burn it to a CD and take it on the road with you. Vol.2 definitely goes a little bit deeper in the archives of 90’s R&B: we pulled out tons of slept-on tracks, rare versions and remixes. Mix of the Day: Lefto " Summer of 2013 #1"